← Reminder: June Jubilee is this Saturday! 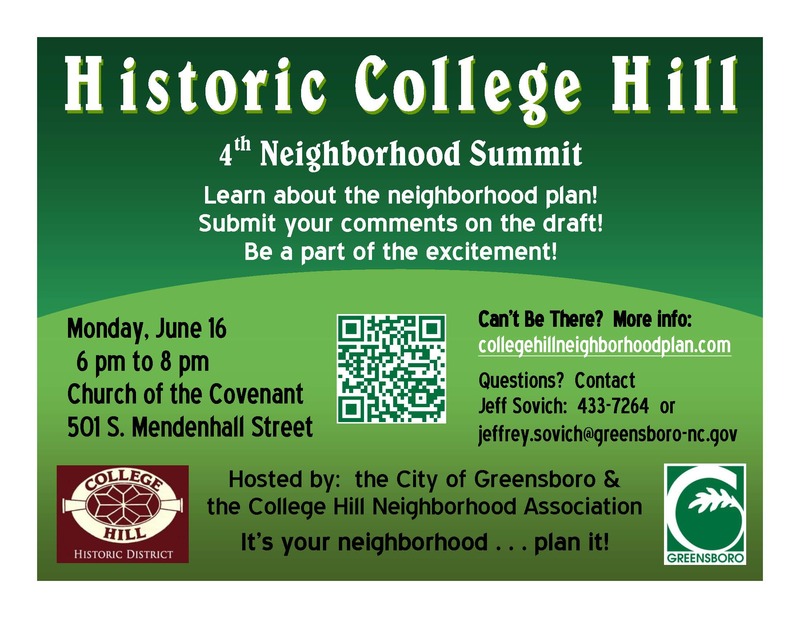 One week from tonight, the neighborhood and the city Planning Department will hold the fourth and presumably final neighborhood summit on the College Hill Neighborhood Plan. Click here to see the plan (PDF). 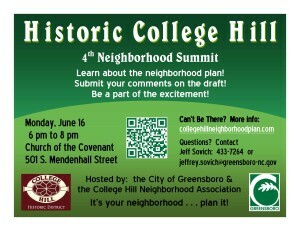 Monday, June 16, 6 p.m. to 8 p.m., Presbyterian Church of the Covenant, 501 South Mendenhall Street. More than 40 neighborhood residents have taken part in the development of the plan. Whether you have attended previous meetings or not, the neighborhood association and city want your opinions, concerns and interests to help shape the outcome. Please join us on the 12th. If you have questions or need further information, contact Jeff Sovich of the City Planning Department, 336 433-7264, click here for email. This entry was posted in College Hill Neighborhood Association, Presbyterian Church of the Covenant. Bookmark the permalink.